At Ribble Valley Recliners we Specialize in a Free, No Obligation, Recliner Home Demonstration. We probably stock the largest range of lift and tilt Mobility Recliner Chairs in the North West. Electric Riser Recliner Chairs (also called Lift and Tilt chairs), Pressure Management Chairs and Transportation Chairs are all available. I do. Richard Wood. The owner of the business. Over 15 years of fitting has given me a vast product knowledge. I have the experience to asses your needs and give recommendations to provide a chair which is tailored to your requirements. I can give advice and guidance which will help you choose the right chair. We are aware that many customers cannot come to our Showroom, because of mobility issues, or the distance to our Showroom in Lancashire . This can be the best way to find the perfect chair in the comfort of your own home. 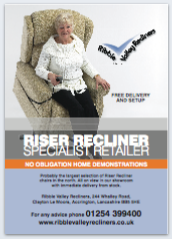 We offer a Recliner Home Demonstration right across the UK. We offer a “no obligation” onsite Recliner home demonstration service to our Customers. All conducted in a relaxed friendly atmosphere. Before I come out to you I will ask some questions about your Size and Dimensions. This will ensure that I bring the most appropriate chairs. Any Special requirements can also be discussed such as Waterproof fabric, Pressure sore management, etc! I can bring a selection of chairs along with me. All our Chairs are British Made, Quality products which come with a 2 -5 year warranty. Because we have discussed your requirements before the demonstration, it’s quite possible that the chair maybe a Perfect fit. In This case you can keep the chair, there and then! I will also bring Swatches of different Fabrics or Leather for you to choose your own. We will then make the chair to your specifications, and I will return to deliver and set up the chair. I will make sure you are familiar with all the controls and workings of the chair before I leave.
? Will You get ripped off! No. Never. When we discuss your requirements I will give you the prices of the chairs before the demonstration. Our Prices are fully transparent and you will know the type of prices you will be paying! Typically, Our prices range from £1300 to £1500. The Demonstration is with No Obligation to Purchase. I do not do any Pressure selling. You are welcome to have a Friend or Relative on site with you for your peace of mind. We are a small Husband and Wife team Family business who promote fair play for our Customers. We want to be Recommended throughout your Friends. So we rely on giving Great service at the best Prices. Using us can literally save you Thousands of Pounds. We are a Family Husband and Wife run business. We have no commission based sales people, therefore no pressure selling. Your inquiry is personally dealt with by the Owners. The same person from consultation through to delivery and set up. We will not sell you anything you do not want or need. We only sell chairs of the highest quality. Ribble Valley Recliners deliver the best Service and Value possible. Large selection of Mobility Electric Riser Recliners on show in the North West. Personal Fitting service in your own home. Recliner Home demonstration are available Nationwide. We are centrally located to easily service Lancashire, Yorkshire, Manchester, Cheshire, Cumbria, North Wales, Staffordshire and Derbyshire, but we will also do Recliner Home Demonstration across the UK. Please ring, email and contact us and we will send you some information on our range of Chairs and Service. Download our Recliner Home Demonstration pdf. Customers vary in shapes and sizes and the chairs are made in different sizes to match. A few details of height and weight will give us and idea of the suitable chairs to demonstrate. From a home demonstration we can carefully asses the correct measurement of the seat height, width and depth, ensuring that feet touch the ground, and perfect posture with good lumbar and back support. We Specialise in catering for chairs with dimensions which are outside the everyday stock range. Our chairs are all high quality British made. We stock many chairs for immediate delivery needs, and can make made to measure chairs in a full range fabrics, leather and contract materials. Electric Riser recline chairs come in a range of actions. Single motor / Dual Motor / Wall Hugger / Tilt in Space. All actions are available in a range of dimensions. For Riser Recliners, we can use our Langdale Dual Motor Tilt In Space chair for all riser recliner enquiries. Seat depth can be altered from 20 to 18, and a variety of backs can be demonstrated. Download our Langdale brochure pdf here. For Pressure Management issues we can demonstrate the Care Air Chair which incorporates an alternating air cushion. Waterproof contract fabrics are available as shown. Download our Care Air brochure pdf here. For Transportation in a comfortable chair, then the Transporter TIS can be demonstrated. Where the client is hoisted into position, this chair can then be moved from room to room without the need for constant changing from wheelchairs. Download the Transporter TIS brochure pdf here. We are a family husband and wife team who believe in giving the best customer service experience to all our clients. With us you will only be supplied with what you need. No Obligation to buy with a demonstration, and no pressure selling techniques. We have had many repeat sales from our Customers to passing on the good experience to their friends, and have made many deliveries to the same Sheltered Housing Accommodations, ‘where word of mouth’ gets round due to good customer feedback. Remember, we have no pressure selling, and we are considerably better value than our competitors. Check out our Range of Available Recliners.